Recently my employer asked for my Twitter address, to publish my tweets on their website. Other colleagues admitted to not tweeting, or suggested that our employer really wouldn’t want to publish their tweets. 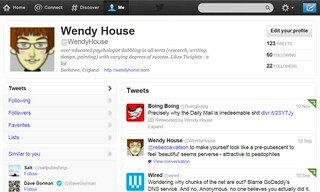 As wendy, I’ve dabbled but not really been drawn in. Should I twit? And how long should I spend twitting if I do? Who do I want to read my twits? Do I have to use a spell-check on all my tweets to avoid irritating those people who can’t see my conceptual wood because of my grammatical trees? What should I twit about? What do professional tweeters, who are published on their employers websites, do? What sort of ‘voice’ should I use? Directive? Cheeky? Subversive? Do you think I’ll ignore all these tricky questions or other? What have you done, and why’d you do it? This scribble was published on Sunday, December 9th, 2012. You can follow any banter on this scribble with the RSS 2.0 feed. You can share your inspired musings after typing the anti spam word near the bottom of the page. But no Pinging because its too naughty. Indigo, I’m a consultant, the company I work for provides expert services so they want to profile their experts. It’s not unusual to have consultant Bio’s on a company website with topical information e.g. twitter feeds. Random sound like good fun! I’ve found a way around it, me (as wendy house) follows me (as professional) then I can at least take my professional feed a bit off-kilter with a retweet or conversation if I want to… …and without owning some more cheeky views that might upset sensitive clients. I can also be signed into both accounts simultaneously by using two different browsers.